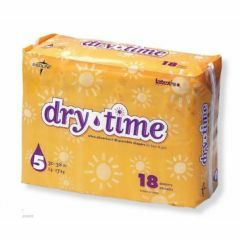 Dry-time Baby Diapers The side panel and cloth-like outer cover of our Dry Time Baby Diapers enable the skin to "breathe", which helps keep skin dry. Foam elastic waistband and anti-leak cuffs reduce accidental leakage. Polymer controls odor, and no-tear tape surface allows refastening to reduce waste. Find a wide variety of incontinence care products at Allegro Medical from the brands you trust when you shop our entire website. We have a number of incontinence medical aids to help you and your patients deal with the effects of incontinence today.